The Principality of Andorra has been designated an offshore financial centre by the International Monetary Fund (IMF), the Organisation for Economic Co-operation and Development (OECD) and the Financial Secrecy Index (managed by the Tax Justice Network). The baking secrecy in Andorra has been loosened somewhat in recent years as Andorra has signed more information exchange agreements, but from a European perspective, it still remains strong. If we look globally, there are other offshore centres available that are stricter than Andorra when it comes to banking secrecy. The banking sector contributes substantially to the economy of Andorra. Combined, the financial sector and the insurance sector make up roughly 20% of GDP. The banking sector of Andorra is especially known for personalized banking for high net worth individuals. The banks are regulated by Institut Nacional Andorrà de Finances. All six banks are open to non-residents, but their exact requirements vary. Banca Privada d’Andorra (BPA) and Crèdit Andorrà are especially known for catering to the needs of non-residents. BPA and Crèdit Andorrà typically require a minimum deposit of €500,000 for non-residents, but can elect to waver this requirement. Crèdit Andorrà has a branch in Panama, and it is possible to open an account in Panama from a Crèdit Andorrà office in Andorra. Andorra has a long tradition of being a tax haven, but principality introduced several new taxes in the period 2012-2015. This was partly due to pressure from the European Union, partly due to lost revenue from the tourism and duty-free sectors in the wake of the European sovereign-debt crisis in southern Europe. A form of value-added tax was introduced much earlier, in 1991. There are also special taxes on the import of certain goods, on certain activities, on electricity consumption, and on telephone services. A 10% business tax was introduced in 2012. A sales tax of 2% was introduced in 2013. A flat rate 10% income tax was introduced in 2015. Employees pay social security taxes at rates of 5% – 9% on their salaries. Employers pay social security taxes of 13% on their employees’ salaries. Andorran incorporation requires a minimum of one resident director, and the costs associated with company incorporation in Andorra are also comparatively high. This is two of the factors that explains why Andorra isn’t a very popular choice for offshore company incorporation, despite a competitive corporate income tax situation by European standards. Tax rates are low for Andorran residents, but the overall cost of living in Andorra is moderate to high compared to the Western European average. Roughly half of the Andorran residents considered themselves ethnic Andorrans. Roughly 25% of the residents come from Spain, 14% from Portugal and 4% from France (2012 data). If you have secured a job with an Andorran company, getting a work permit and residency is not complicated. The official language is Catalan, with Spanish, French and Portuguese being officially recognized languages. The most important source of income for Andorra is the tourism sector. Andorra has both summer and winter resorts, and its duty-free status is also attractive for visitors. The other major sources of income for the principality is the financial sector and the insurance sector. Only two percent of Andorra is considered arable land and the principality’s agricultural production is very small. Andorra therefore relies heavily on imported food. The principality is also highly dependent in importing electricity from Spain. On average, 60% of the electricity is imported from Spain, with the rest being produced within Andorra by the Les Escaldes hydroelectric plant. Manufacturing output consists mainly of cigarettes, cigars and furniture. Some of the tobacco used is grown within Andorra. Andorra’s natural resources include hydroelectric power, mineral water, timber, iron ore, and lead. The Principality of Andorra (Catalan: Principat d’Andorra) is a sovereign microstate in the Pyrenees mountains in Europe. It is landlocked and bordered by Spain and France. An alternative name for this microstate is The Principality of the Valleys of Andorra (Catalan: Principat de les Valls d’Andorra). Andorra was created under a charter in 988 and the present principality was formed in 1278. Interestingly, it is a principality headed by two co-princes: The President of France and the Roman Catholic Bishop of Urgell in Spain. 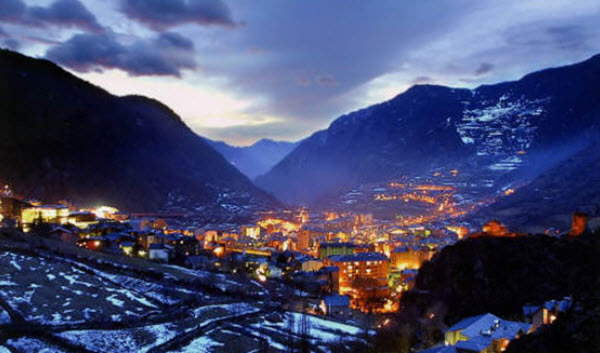 With an area of less than 470 square kilometres, Andorra is the 6th smallest nation in Europe. 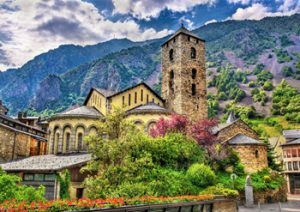 It is nestled in the Pyrenees mountains, and with an elevation of over 1,000 meters its capital Andorra la Vella is the highest capital in Europe. Andorra is not a member of the European Union (EU) but has a special relationship with EU and has adopted the Euro as its official currency. Until 31 December 1999, Andorra used the French franc and the Spanish peseta in banking transactions. Since 2014, Andorra is allowed to issue its own Euro coins (but not Euro bills). Andorra is treated as a EU member for the trade in manufactured goods (which means no tariffs) but as a non-EU member for the trade in agricultural products.